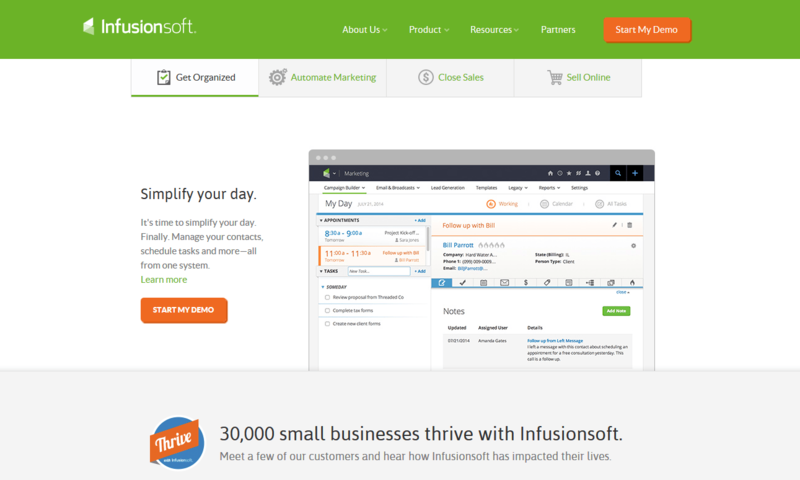 Infusionsoft is a very powerful and sophisticated web-based software dedicated to small business that gather CRM, marketing automation, e-commerce and payments solutions, an equipped marketplace of apps, integrations and partners all in one place. Its aim is to maps out each step of your sales and marketing strategy and automates repetitive tasks letting grow your business and save your time. Going beyond traditional CRM systems, Infusionsoft capture everything about your leads and customers in one place, including pages visited on your website, landing page and form submissions, opened emails, clicked links, where your points come from, sales stage, customers’ purchase activity. Of course, all these information can be used to help automate your sales process, and this is definitely the most strong feature of the product. On the other side, Infusionsoft requires some IT expertise, and all the time will make you save in the future it will take away at the moment to setup because it could be very confusing and overwhelming when you are first starting out. To get full value from Infusionsoft, you have to know perfectly how to use it, which is why the company recommend its training. The coaching is part of the kickstart package (that you can purchase in addition to the chosen monthly fee) and it’s a bit pricey indeed, but could be a good investment to get the most from an excellent software. Infusionsoft’s coaches will run you through their setup process and give access to new user webinars: four sessions of thirty minutes extremely useful for newcomers (but maybe not enough which is why Infusionsoft has added lot of webinars). If you are an advanced marketer, you could probably learn to use the software thanks to the Infusionsoft’s resources center (tutorials, help docs, video library, an easily searchable user manual, chat support) and a lot of patience too! Infusionsoft also offers a campaign builder that lets you easily create newsletters, landing pages, web forms and more using the drag-and-drop editor tool. You can also monitor your email marketing campaign effectiveness with remarkable insight. Infusionsoft is a good all in one marketing solution with a definite learning curve for the more complex functions, but all things considered quite intuitive (above all its email marketing campaign builder feature).